Although many Christians will work and strive to produce good fruit, sometimes they end up back under a system of works or a modernized version of the Mosaic law. There was fruit involved for those Jewish people who were under the law of works, but it brought fruit for death. 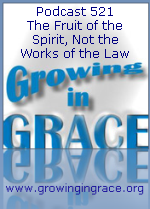 In the new covenant of Jesus Christ, we have been freed into the new way of life in the Spirit. Instead of working to produce fruit through our efforts, we simply rest and abide in Christ and the Spirit bears His fruit through us.